With 2,700 exhibitors, filling 1.8 million net square feet of exhibit space, and over 140,000 attendees, CES is simply the largest consumer electronics show in the world. For the past few days we have been on the showfloor talking to companies and getting the scoop on new technologies that hopefully will see the light during 2007. Here's part two of our coverage which goes through a number of interesting things we saw, from LED backlight laptops, to fuel cell batteries, ASUS' XG Station which lets laptops use desktop videocards, prototype OLED screens from Sony, and a full body game controller. You can also check part one of our CES 2007 coverage here. Although we did not have the time to stop by Lenovo’s booth at CES, we did meet with a few of their PR people at Digital Experience (a CES press-only sideshow). 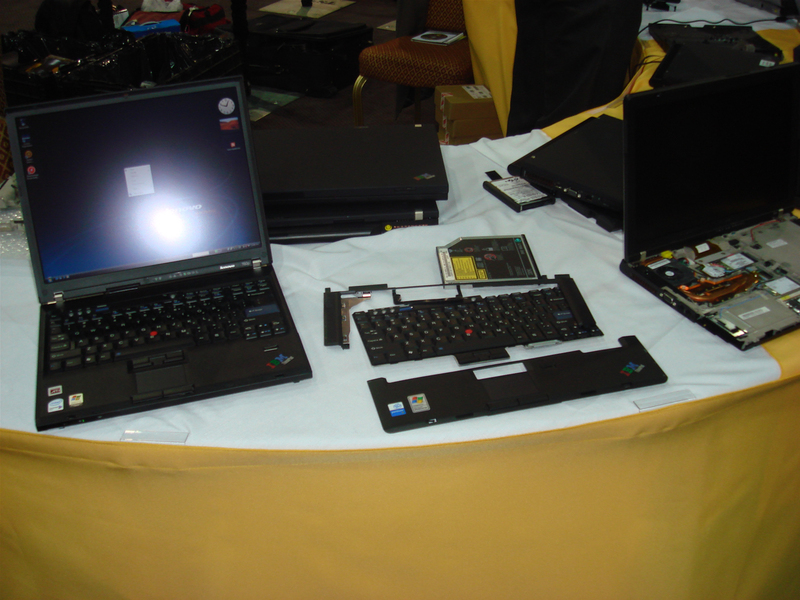 At this event they were showing both Lenovo portables and some of the newer ThinkPad models already available in the market. Unlike other traditional laptop manufacturers they did not seem eager to rush newer models with sideshow screens or features, although it was obvious that starting this February they are shipping all computers with Windows Vista as its main OS. By looking at their current line-up, I was happy to see more polished and less generic looking Lenovo-branded laptops that in a way are starting to look more like ThinkPads with a twist, in order to attract the general consumer. 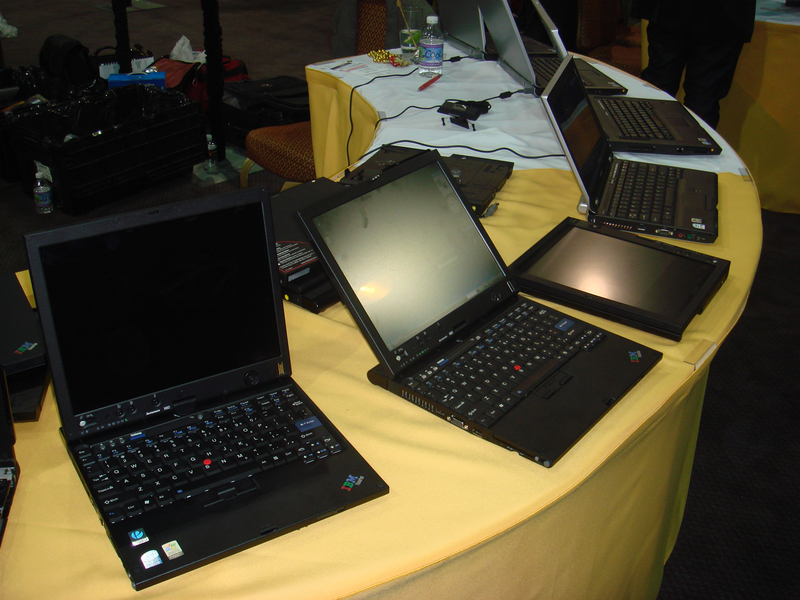 As far as ThinkPads go there was nothing really new to be seen, as their tablet and titanium models have been around for quite a while now. I did spend some time with their latest X60 ultra-portable which looks and feels awesome using a 12.1” screen, full sized keyboard and weighting in at about 3 pounds. I had to wonder however – as many other ThinkPad owners and fans do - why Lenovo has not introduced such an ultra-portable model that comes with an optical drive (and touchpad as well for that matter). Lenovo’s response was that they would have to sacrifice other features that are usually unique on ThinkPads, and that’s the plan they are sticking with for the time being, that is, not following the pack and keeping the line streamlined to their intended target market. Lenovo does offer a 12” sized laptop on their 3000 series with an optical drive however. 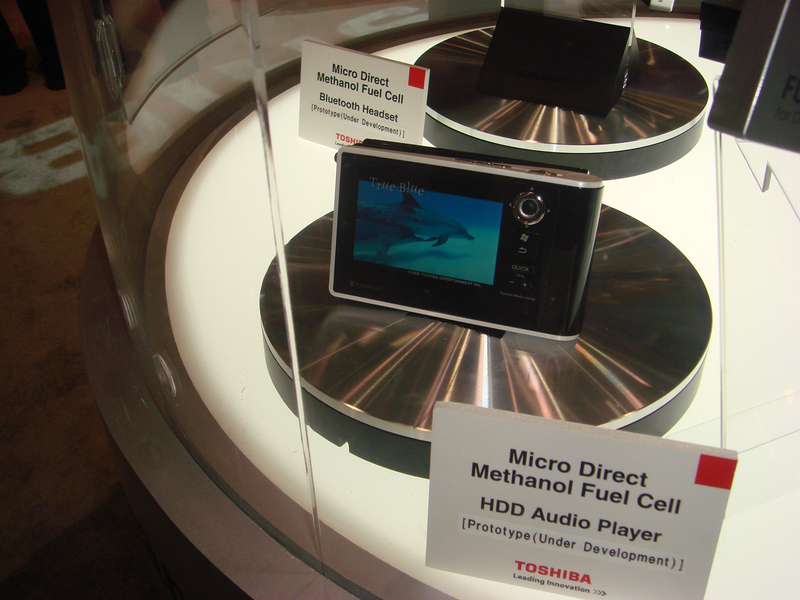 Toshiba invited us to their booth to spend some time with their new mobile offerings announced during CES. First they introduced us to their latest Qosmio G35 laptop, which is meant to be an entertainment focused desktop replacement. 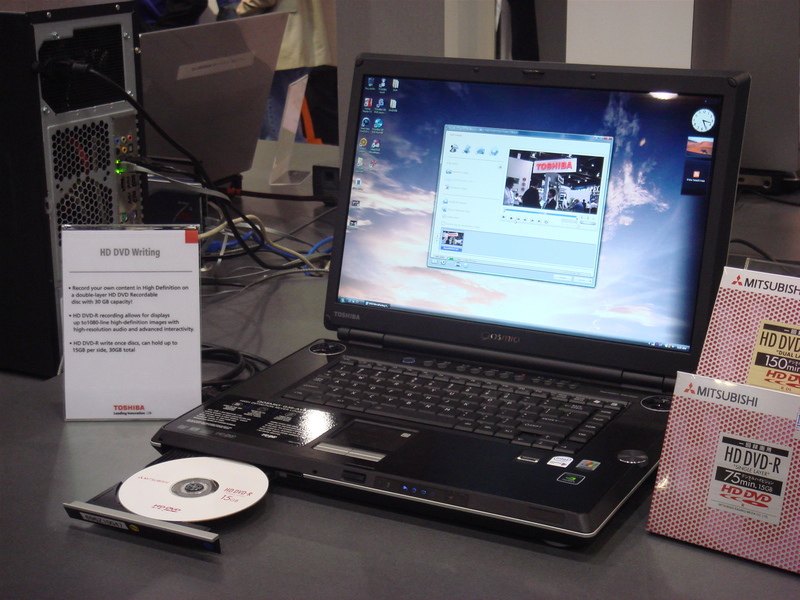 Besides using the latest Core 2 Duo processors from Intel, they are equipping the new Qosmio with HD DVD recording capabilities and state of the art (for a laptop) graphics and audio connectivity. 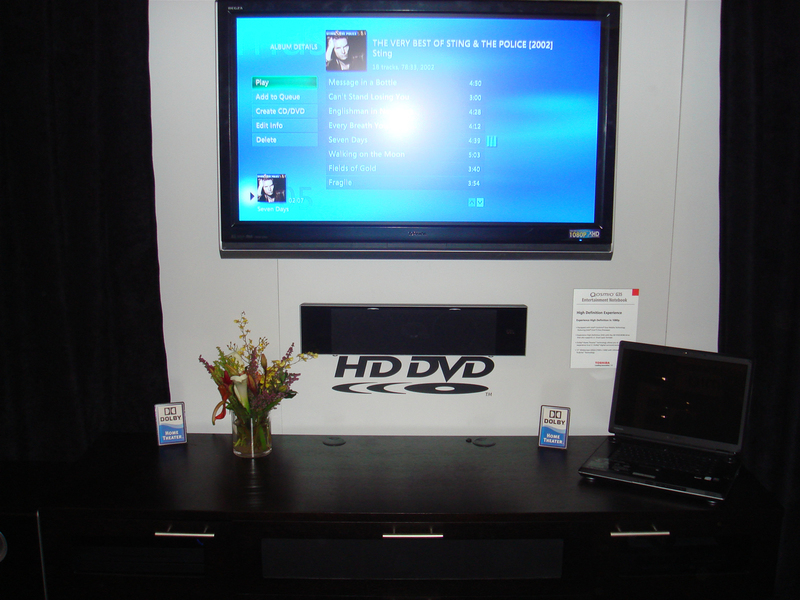 I was shown two scenarios, one where the Qosmio was being used for living room entertainment in conjunction with Windows Vista’s Media Center features, a large LCD screen and a home theater speaker set. The second scenario had the laptop recording HD DVD discs with high definition content. 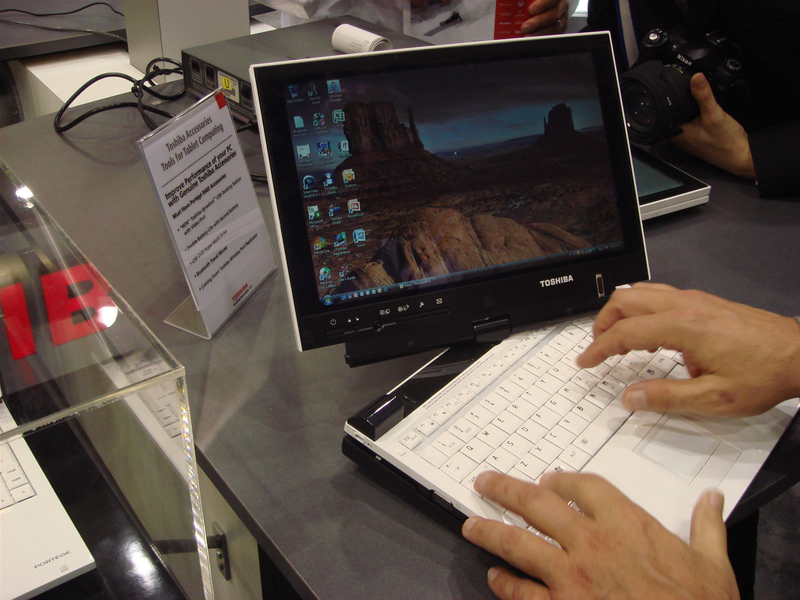 Perhaps a more interesting showing was that of the new Portégé R400 Tablet PC and Toshiba’s wireless dock. Although meant to be a business-oriented laptop, the latest Portégé looked fancy enough to appeal any kind of crowd with a very stylish and upscale white finish. This model did carry some sideshow features although we were unimpressed by its one line LCD screen (truth be told we yet have to be impressed with any of the sideshow implementations we have seen so far). This was the first laptop we were shown that used new LED backlight technology which not only delivers better output but saves on battery life. Overall it seemed to be a very solid, well constructed laptop that should appeal to those willing to spend big bucks on a quality tablet. Along with the R400, Toshiba showed a wireless dock which acts like a standard laptop dock, handling video, LAN, USB, and other connections, just that this new dock can do it wirelessly (range has to be less than 3 feet away). We were shown some video playing and desktop multitasking on the laptop screen and a monitor connected to the dock and there was no quality loss or skipping frames suggesting the device can handle the necessary load. The dock has no set release date as the model we were shown was a prototype, while the new Portégé is expected to hit the market as soon as next month. 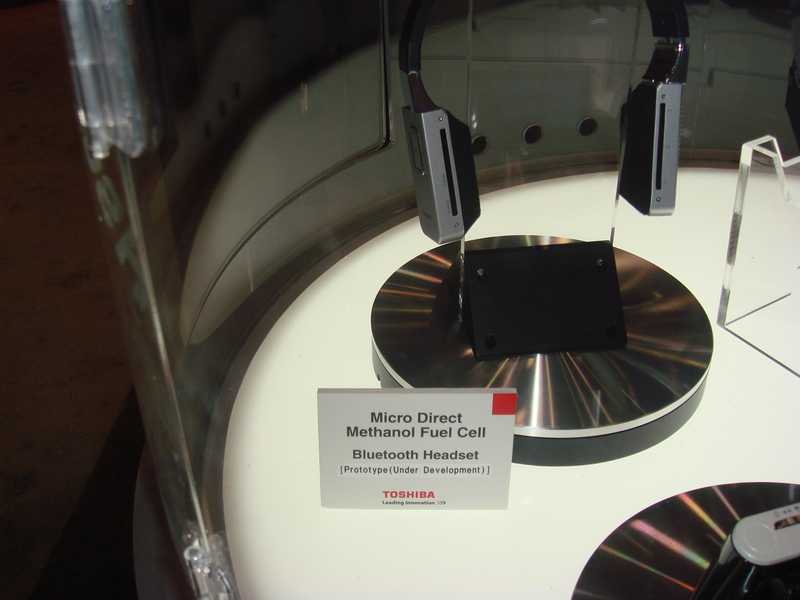 On a pure technology showing, Toshiba also demonstrated the use of prototype methanol fuel cell powered devices. 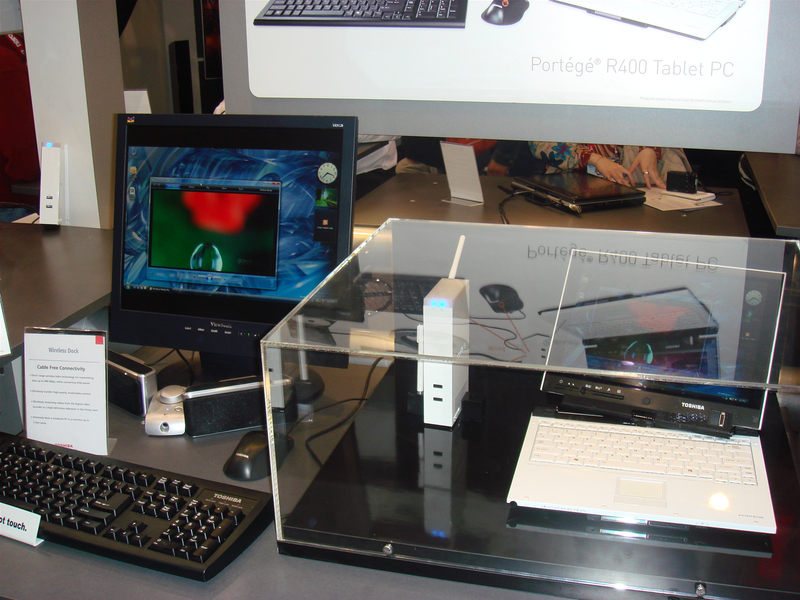 They displayed a laptop, a Bluetooth headset, and a portable media player, all of which ran on methanol fuel cells. Although there are other types of fuel cells like the hydrogen ones, methanol is a liquid much safer to handle and opposite to hydrogen, it does not require special under pressure containment. We were explained that there are two types of methanol fuel cells, active and passive. The active methanol fuel cells offer more power and a longer battery life, but require cartridges to charge. The laptop on display used an active fuel cell. The media player and the headset used passive cells. Interestingly enough it only took a couple of seconds to charge them. For the active cells you have to change the cartridge and you are set to go, and in passive cells all you have to do is grab your methanol bottle, squeeze the liquid into the battery pack and you got a full charge. Reportedly one charge for the portable media player lasts seven hours. We were told Toshiba expects to debut this technology in a couple of years first in the Japanese market and then to the rest of the world.